Hey folks, Jack here. 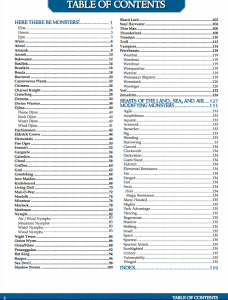 Today I wanted to talk a bit about our recently released Fantasy AGE Bestiary, which is currently available in PDF from our store and DriveThruRPG. In particular I want to talk about what monsters, creatures, and adversaries are found in the book and why they were chosen. I don’t want to give away every statistic or tidbit in the book, but I thought it might be fun to give at least a comment or two on several major entries in the book to show prospective buyers what they can expect when they get the book and to also give those who have already bought the book a fun bit of insight into why particular monsters were chosen. So, without further ado, let’s get started. I’ve always been a fan of both Arthurian legends and Chaosium’s Athurian rpg Pendragon. The Afanc is one of the few truly “fantasy” monsters included in that game and one that’s rarely included in fantasy rpg bestiaries. So I thought it would be a good way to kick things off. Insect-like humanoids are popular in various fantasy settings and rpgs and it seemed like a great idea to have one of our own. Honestly, these were simply never not considered. Beastmen are cool and commonly used in various settings. Also, I’m a big fan of The Island of Dr. Moreau and other early works of pulp sci-fi where beastmen are common. This one was all Chris Pramas and I’m jealous he thought of it first. Not only is it a great mythology inspired entry, it includes a variant for gnolls, a fantasy rpg staple. As a long-time Dune fan and someone who understands the utility of creatures such as the purple worm and various Lovercraftian worm-like monstrosities in many campaigns? This was an obvious choice. I wanted a mimic or cloaker-type monster that seemed less preposterous and “ha ha! You thought you found something cool but that chest is eating you!” and could serve as a threat even when preying on NPCs. As a creature that serves as a natural predator to dragons, I found this entry satisfied my idea that fantasy realms should be at least a bit like real ecosystems, despite all the magic and such. Fortunately, various medieval scholars were imaginative enough to create this beast so we didn’t have to. Not only is this a fantasy staple, I admit I always found ghoul-like creatures fascinating since I read Pickman’s Model years ago. Also, I recently played a video game that featured ghoul-like creatures (not naming it to avoid spoilers for the game), so they were on my mind when I started listing likely creatures for the book. Some of the entries in the book were actually inspired by artwork our contributing artists turned in without an attached creature. We said “make us some creature and we’ll use your illustration as inspiration for an entry”. The Groi was one such entry. I looked at this guy and he looked…kinda cute in an ugly puppy sort of way but still dangerous. So then I thought? What if dwarves or some other subterranean civilization had “dogs” that were in fact subterranean animals they tamed. And so the Groi was born. Note every monster needs to be complex. Here I just liked the idea of a knife-toothed hound. I also thought this and few other creatures included were solid but unique enough that they could feature in various settings and campaigns, from home-grown fantasy settings to our own Titansgrave and others. I blame my love of B-movies featuring flesh-eating crawling humanoid horrors and H.G. Wells stories (see Beastkin). I have no idea. I mean, I know I wanted to take the already disturbing idea of the real life “rat king” and make it fantastical and scary. And I always liked the idea of hivemind monsters who can grow from minor to city or even kingdom threatening menaces over time. But why this particular monster over say, a swarm of sentient wasps or ants? I don’t really know. But it’s one of the entries I wrote I’m personally the happiest with. Another cryptid or urban legend inspired entry, this was also wanting to show that you could have formidable threats that were subtle, indirect, and mechanically supported by the AGE system. Dinosaurs are cool. Also, in various sword and sorcery stories, particularly comics, I always loved when some hero would end up fighting a “dragon” that turned out to be a big scary dinosaur or giant crocodile or something. The Thunderlord is an homage to those stories. Well there you go, just a few of the entries and why they developed as they did. If folks are curious, let me know and I can come back and talk more about other entries in a future Round Table. 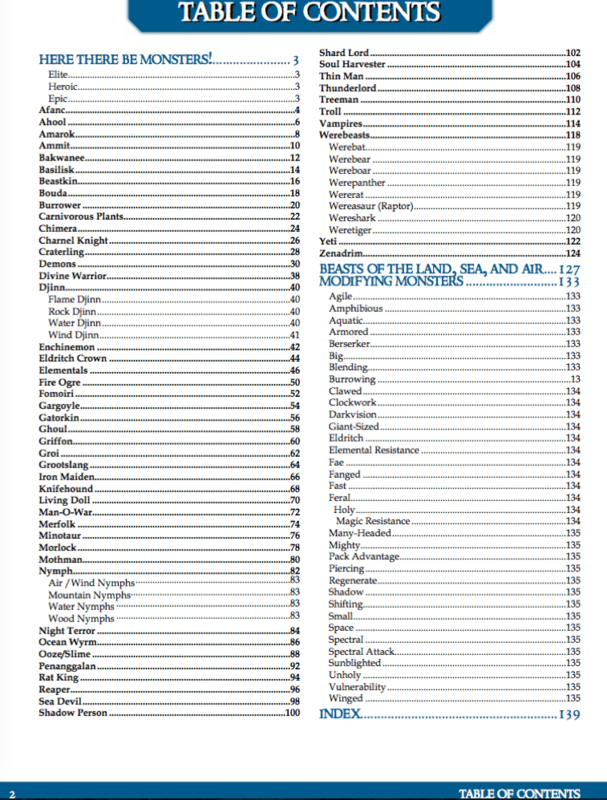 Also, if you want to get a look at the full list of included monsters (not including every animal in the Beasts of Land, Sea, and Air chapter, check out the Table of Contents for the Fantasy AGE Bestiary. See you next time!